The Minturn Summer Concert Series welcomes Johnny Campbell & The Bluegrass Drifters to the stage at Little Beach Park in Minturn at 6 p.m. today. Johnny Campbell & The Bluegrass Drifters are Johnny Campbell, a third-generation fiddler hailing from Nashville, Tennessee; his wife, Whitney Campbell, on bass; Jeff Burke on mandolin; Chris Carter on banjo; and Carl Caldwell on guitar. 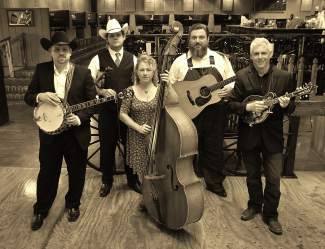 Johnny Campbell started the Bluegrass Drifters in Santa Cruz, California, with Whitney, and the traditional bluegrass band now hails from Nashville. Concertgoers are invited to bring a blanket to sit on, a picnic dinner and 3.2 percent alcohol by volume cans of beer only to the park for the free show. For more information, visit www.minturncommunityfund.org. The Minturn Summer Concert Series welcomes Johnny Campbell & The Bluegrass Drifters to the stage at Little Beach Park in Minturn at 6 p.m. today. Johnny Campbell & The Bluegrass Drifters are Johnny Campbell, a third-generation fiddler hailing from Nashville, Tennessee; his wife, Whitney Campbell, on bass; Jeff Burke on mandolin; Chris Carter on banjo; and Carl Caldwell on guitar. Johnny Campbell started the Bluegrass Drifters in Santa Cruz, California, with Whitney, and the traditional bluegrass band now hails from Nashville. Concertgoers are invited to bring a blanket to sit on, a picnic dinner and 3.2 percent alcohol by volume cans of beer only to the park for the free show. For more information, visit http://www.minturncommunityfund.org.